The location: Jimmy's Boat Dock. Q. What is it supposed to be on the show? A. The marina slip where Jimmy docks his boat in the third season. (In the first season, he docked it near Marina Del Rey, at Burton Chase Park). Q. Where is it supposed to be on the show? A. In a Newport harbor marina. Q. When did we see it on the show? A. We see Jimmy's boat, Slow Dance, in the very first episode of the third season ("The Aftermath"), where the kids sail it to a secluded cove and play around on the beach. The dock itself is seen (at night) later in that episode, when the police arrive to arrest the kids on the boat - just as the are about to take off for Catalina (to avoid Trey trouble). The dock isn't seen again until seen until Episode 3 (season 3), "The End of Innocence", where Julie & Jimmy are together on the boat, looking forward to the reading of the will and their marriage. After Julie leaves, Jimmy's loan shark drops by the boat to threaten Jimmy about paying his debts. Q. What is it actually in real life? A. A slip in an actual marina, but not in Newport. Q. Where can I find it in real life? A. In the third season, they changed the location of Jimmy's boat. This time it's at the Cabrillo Marina in San Pedro, CA, not that far from the Los Angeles harbor's main channel (where you'll find Ryan's fishing fleet). The Slow Dance was docked at the end of the pier at Berth 29, Gangways A & B, right behind the Marina Operations Building at 224 Whalers Walk. San Pedro is located at the south end of the Harbor (110) Freeway. 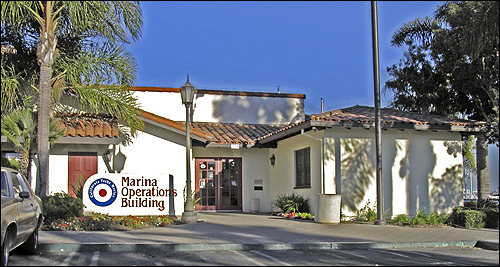 To reach the Cabrillo Marina from the Ports O'Call area, take Harbor Blvd south to 22nd Street, turn right (southwest) on 22nd Street and take it to Via Cabrillo Marina. Turn left (south) on Via Cabrillo Marina. The marina will be on your left side. 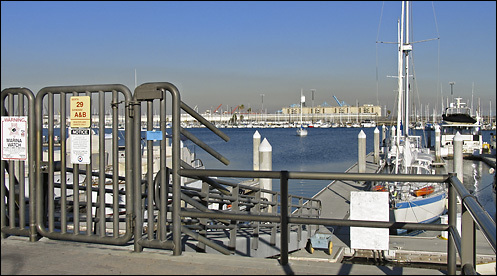 To find the exact dock (Berth 29), follow Via Cabrillo Marina to its end, which is a loop. There, you'll spot a side street called Whaler's Walk, which leads into a parking lot. Park as close as possible to the Marina Operations Building (it's well marked), and you'll find the dock they used right behind that building. Here's a map link. And here's an aerial photo (from Live Local) with a pin marking the exact spot. 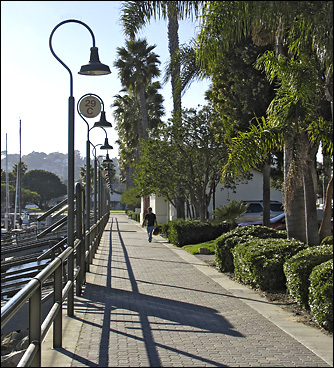 Now, here are some photos I shot in late 2006 of the same Cabrillo Marina dock area. To the right (south) of this building is a walkway along the marina. 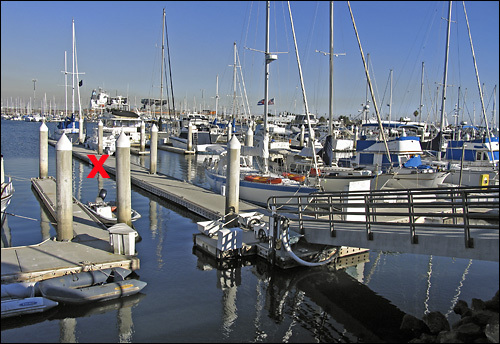 which leads back (east) to Jimmy's dock at Berth 29.
the red X marks the approximate location where they filmed the boat scenes. But the gangplank to the dock is gated & locked, so there's no access to the boats themselves. Which is probably a good thing. These boats are private property. Some people make these boats their homes. So don't trespass, don't touch the boats, or do anything else that might disturb the privacy of the owners. A. It wasn't easy, since all marinas tend to look alike. But freeze-framing the scenes produced some clues. The first was a distant background that showed some low-level industrial buildings, something you won't find on Marina Del Rey's condo horizon. That led me to suspect that they probably shot it at the Cabrillo Marina, which is located close to the working Los Angeles harbor. Next, I spotted a red-tile-roofed building in the immediate background. The problem is that virtually all of the many buildings at Cabrillo Marina have red-tile roofs. So I went to Live Local, and looked at aerial photos of each red-rile-roofed building, one at a time. I could eliminate two-story buildings and those with no tile roof visible right above the windows. 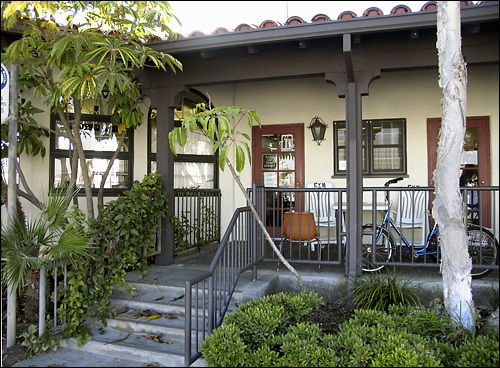 Also, the building in question had a number of palm trees out front, and what looked like a row of El Camino Real-style Mission bells along the walkway (these turned out to be unusual street lights). Finally, I thought I had narrowed it down to a single building at the southeast corner of the marina. But the aerial photo didn't show enough detail to be certain. So I grabbed my camera and headed down to the Cabrillo Marina. This was a familiar spot. I had been there just a few months earlier, shooting a photo of the pirate ship from Disney's Pirates of the Caribbean, which was docked for repairs across the channel. I walked down to the southeast corner, and compared the windows, doors and palm trees on the building there with a print-out of the screencap. And sure enough, they matched perfectly. THE O.C. screenshots from the show and all related characters & elements are trademarks of and © Warner Bros. Entertainment Inc.
All other photos & text are Copyright � 2019-Gary Wayne and may not be used without written permission.